Picatinny's facilities are spread out much like a fantastically huge college campus. Entering through a barricaded checkpoint, then following a winding road through the wooded hills of North Jersey, you follow the trees into part of an 18-hole golf course. In the distance you can see a tower used to drop test equipment—which, I'm told, at the top has a great view of New York City. Past the golf course is the main group of the Arsenal's buildings, divided up by departments, each of which focuses on certain areas of research and development or lifecycle management. Each of these buildings has a corresponding number, and there are over 1,000 buildings at the Arsenal. Most have some association with the U.S. Army, as Picatinny houses the bulk of the U.S. Army Armament Research, Development, and Engineering Center (ARDEC). However, other parts of Picatinny house Navy R&D and Department of Defense branches. The first few labs I visited were in the Armament Software and Engineering Center, which deals mostly in lifecycle-management. Lifecycle Management is how weapons systems are maintained during their service in the field for 10-12 years. Throughout their service, these systems will interface with different hardware as the military evolves, and as engineers test and troubleshoot these systems with new components. Inside this building were the CROWS Software Integration Lab, the Spider Software Engineering Lab, and the Collaboration Innovation Lab. 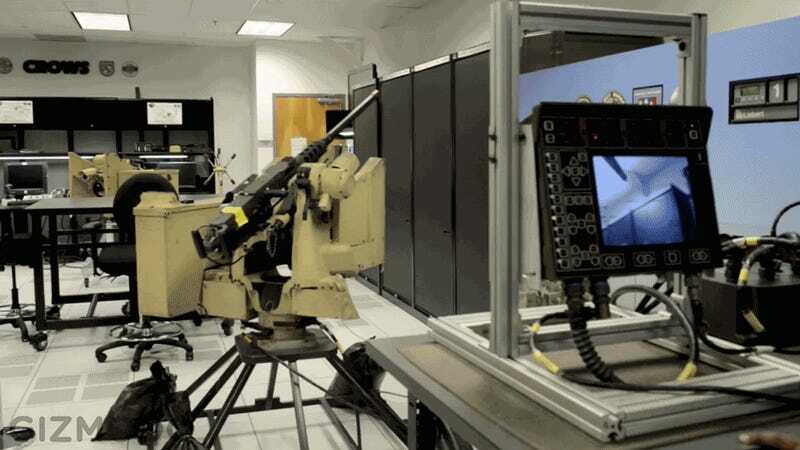 The CROWS Software Integration Lab tests software that interfaces with the Common Remotely Operated Weapon Station (CROWS). The CROWS, a weapons system that allows soldiers to engage targets from inside an armored vehicle, is a common sight around the arsenal. Most labs I visited had it on display in one corner or another due it being developed for and improved upon in multiple capacities. The CROWS system was first deployed in 2004 and since then has seen multiple iterations. Other labs hope to develop technologies that could be integrated into the CROWS system to make it more efficient for combat. In a separate building across the arsenal I was shown the Laser Lab where engineers study reflective properties of glass, specifically in rifle scopes. The lab also reaches out to other areas of scope technology. I saw a proof-of-concept demonstration, showing how a scope could send out a live video feed. Back in the Armament Software and Engineering Center I was brought to the Spider Software Engineering Support Lab; this office deals mostly in lifecycle-management of the Spider network munitions system. Similar to the CROWS, Spiders were deployed in 2004 and are actively used by the U.S. Army; they, too, are consistently being improved upon for modern-day combat. Then there's the Collaboration Innovation Lab, known as the CIL, which is actually more a think tank than a Laboratory. It's basically a room where engineers and scientists can go when they're suffering from inventors' block. The CIL gives them access to different types of literature and creative tools to hopefully spur ideas that will solve issues they are having in their respective departments. There are a variety of tools available to the engineers in the CIL to help facilitate a creative all-angle approach to problem solving. Makerbots, Nikon DSLRs, a set of power tools, Wacom tablets, circuit card printers and endless amounts of software are just a fraction of the environment provided. In addition to the tools, there is a massive collection of reference materials and objects available for checkout. From different tech magazines to DVD instructionals, the lab also keeps a collection of practical inventions on hand to help people think outside the box—like metal velcro, a pocket-able pico projector that doesn't need to be focused, and a fiber optic taper. If someone successfully brainstorms their way around inventors' block, they are encouraged to hit the "Inventors Bell" on the way out. Operating as a totally different department, yet still in the same building, is the Fire Control Fabrication, Assembly and System Vehicle Integration Facility. Here, engineers and scientists work to improve and lifecycle-manage the software used in conjunction with every mortar-control system the US Army currently employs in combat. This includes both mounted and unmounted mortars. In the Mortar Fire Control Systems Integration Lab, I was shown the systems that are built into the mortars, as well as the handheld ballistics computers used to control them. The system used on the mortars—pictured below—compute the angle, velocity, and distance put into a round in order to be as accurate as possible when firing. These systems are integrated with multiple vehicles that use the same type of rounds, like the Howitzer, the Paladin, and the Mortar Fire Control System (MCFS), the latter of which is actually a set of armored vehicles with mounted mortars all controlled by a central vehicle. The software that works in conjunction with all this hardware also needs to be tested in an environment where the vehicles remain accessible. Inside the facility, engineers have access to what they call the HighBay: essentially a massive garage, housing all of the vehicles on which the systems are used. A huge yellow crane that slides back and forth high above the room is used to lift off the top of the tank when adjustments to software and hardware are needed. In order to fire a mortar, soldiers first need to take a test and then they must actually fire a round to be certified. At Picatinny, they've developed a solution through video games... sort of. But don't start thinking Battlefield; these games are much more practical, designed to solve actual problems that platoons might encounter. The Virtual Test Environment Lab showed me two programs used to educate soldiers in troubleshooting a Paladin and the process of firing a Howitzer. 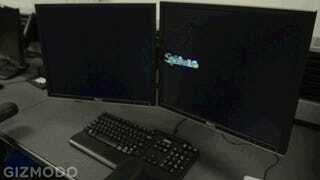 Both games can run with multiple users inside of them. The mortar firing program is designed to have each soldier take responsibility for a certain role where they all collaborate to correctly fire the round. These types of tools help educate soldiers using significantly less resources than usual and when software or hardware changes on the mortars the engineers only have to swap emulators inside the program to maintain what would be in the field. A kit comprised of four computers linked together and bundled in a Pelican case can be sent to a platoon in order to facilitate the certification process. Many of Picatinny's labs work with 3D printing, whether it be plastic, metal, circuitry, or even toothpaste. One lab that works specifically in experimenting with materials and 3D printing capabilities is found across the street from the Armament Software Engineering Center. 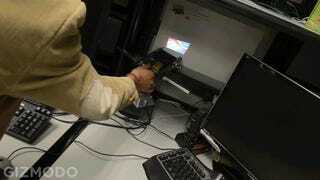 The printers Picatinny use are way more advanced than the Makerbots more commonly seen in the civilian sector. Inside the lab, I saw two machines: one printing very high quality plastics, another printing metals. The machine that prints plastic is capable of such fine printing details that it can actually print an object inside of another object without them being connected. Additionally, it can print flexible plastics, hinges, clips, and other devices not possible using most consumer-level machines. There was another printing lab in a building further into the Arsenal. This lab used machines that printed circuitry onto various materials. I was shown different types of technology that the Army is hoping to develop in the lab, like clothing with antennas printed on them, printed batteries with very thin and lightweight profiles, and missile heads with spiral antennas on them. I was also shown a printing machine that houses different tool heads that the arm can switch between; this means it can fully print a device inside without an engineer having to use different machines to complete the object. When I saw it in operation they were demonstrating it very accurately, by printing designs with toothpaste. The same lab also tests how ammunition responds to salt water. In this cyclic corrosion chamber, seen below, engineers are able to put different types of ammunition through a controlled corrosion process to see exactly what, for example, a bullet would look like after being exposed to heavy amounts of salt water. The ARDEC Technology Testbed Emergency Operations Center deals with a completely different type of technology then the rest of Picatinny. The EOC is a command and control center that's energy independent from the rest of Picatinny arsenal. If Picatinny's power goes down, the EOC can operate fully, no matter what, under any emergency circumstance. The idea of the EOC came about after 9/11, mostly to alleviate the problem that the government found in trying to maintain communication between different emergency responders, like the NYPD and the FDNY. Responders were able to communicate inside their own department but not across departments which led to its own set of issues. The EOC's goal fundamentally is to share information across departments and agencies as efficiently as possible. Much more recently, during and after hurricane Sandy last year, the EOC was operating to relay information to different areas of civilian and government infrastructure. Piccatinny's EOC was a suitably high-tech location for keeping these emergency communication feeds going. After a full day at the arsenal, I drove out past yet more ammunitions labs, a tank garage, the golf course, and many other classified labs I wasn't able to enter, out again through the winding barricades and back onto the congested interstate of New Jersey, heading east into the city, all of this a surprisingly short ride from New York.